I was recently contacted by a home owner who had recently bought a property in Rednal which is a residential suburb on the south western edge of Birmingham near Bromsgrove. They were updating the flooring and discovered a quarry tiled floor under their living room carpet. The Quarry tiles were most likely original dating back 113 years and the owner was keen to have such an original feature restored. 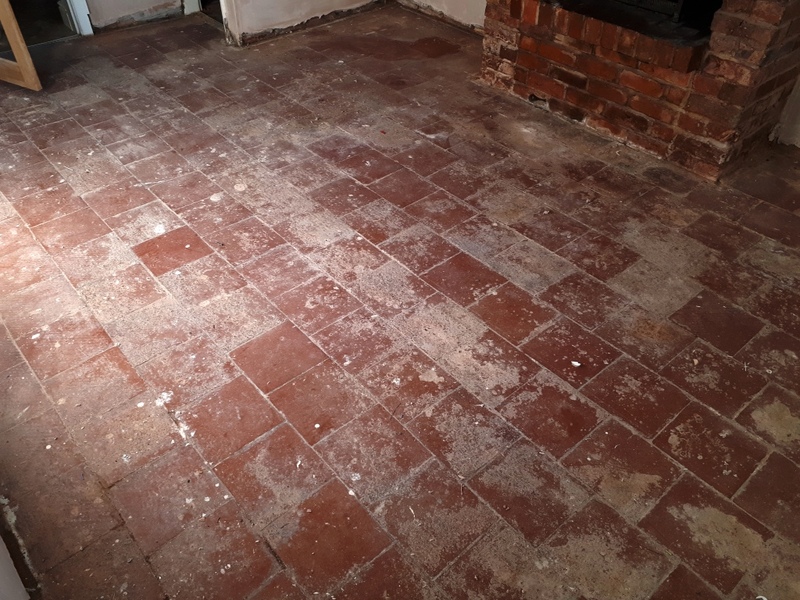 The Quarry tiles were well worn in areas and it looked as though a previous owner had levelled the floor using a cement screed to try and fill in any worn areas. Unfortunately, this had left the tiles with a rough surface and were very dirty as the photos show. My first task was to remove any loose dirt and debris with a wet dry vacuum. 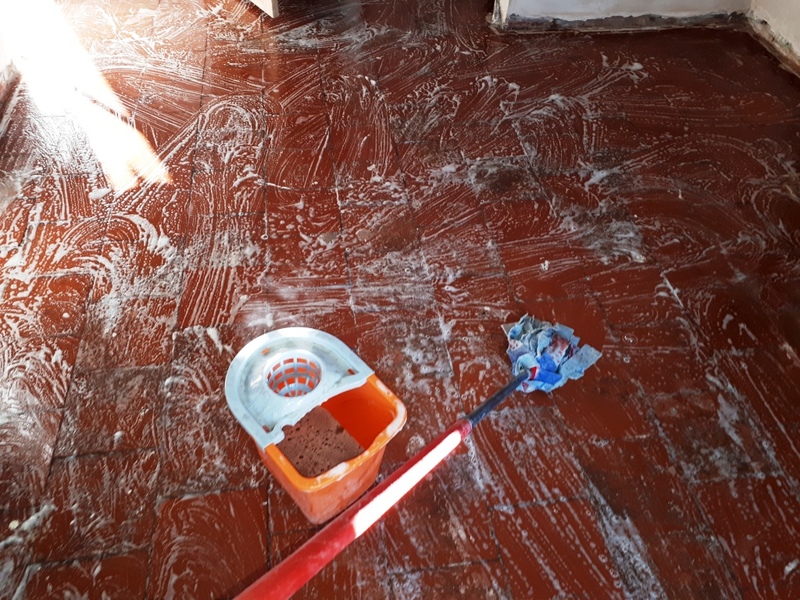 Once done I then applied a strong dilution of Tile Doctor Pro-Clean to give the tiles an initial clean to remove dirt from the tiles. 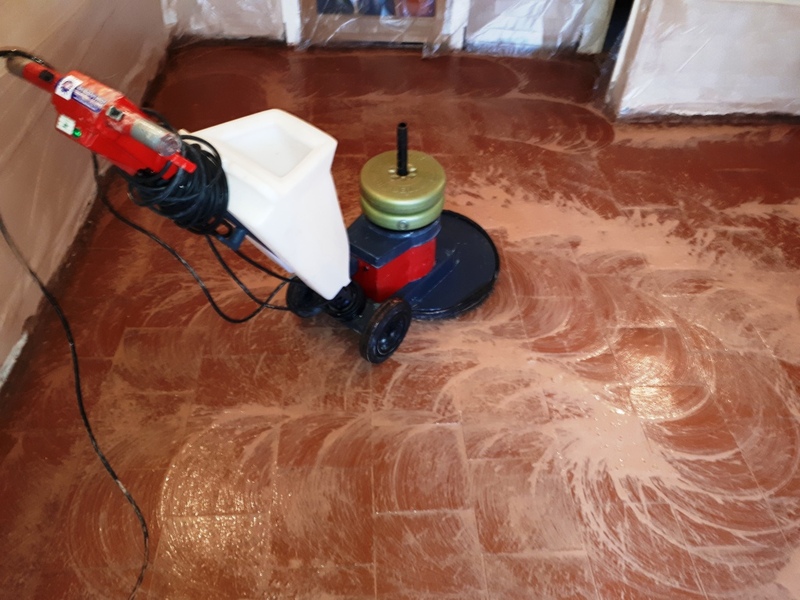 The solution was left to soak into the tile for around ten minutes and then worked into the floor using a rotary machine fitted with a black scrubbing pad. This process highlighted the roughness of the tiles from the cement as the pad was being torn by it. I decided that the best way to remove the cement was to scrape it away aided with a steamer. This meant a few hours on my hands and knees scraping away which was hard work but needs must! When this was completed I used hand held diamond blocks to remove paint marks and adhesive from where the skirting board had been. I then cleaned the floor again with more Pro-Clean and a new black pad, I also cleaned the grout lines with a stiff grout brush. The floor was then thoroughly rinsed off with water to remove any dirt and solutions and this was then extracted using a wet vacuum. 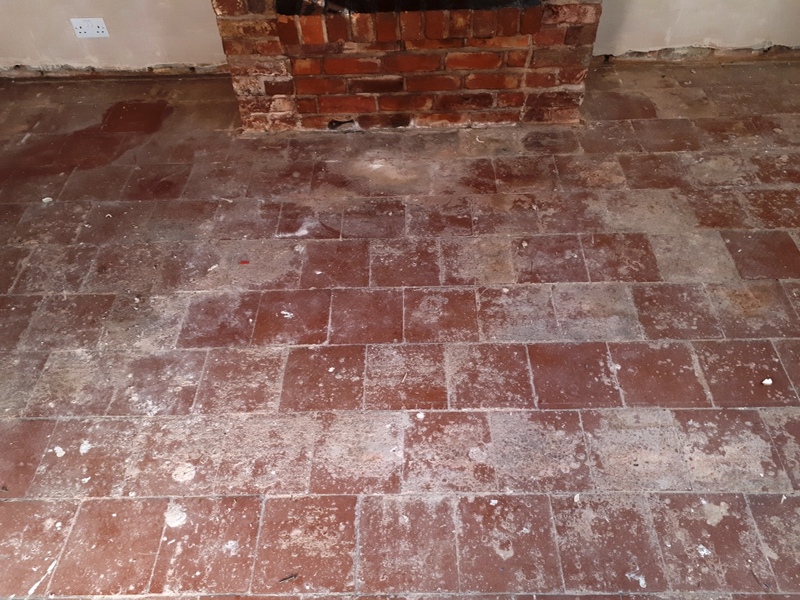 With the floor now clean I could see there were signs of efflorescence markings on the floor which is where salts are carried up through the floor through evaporation. 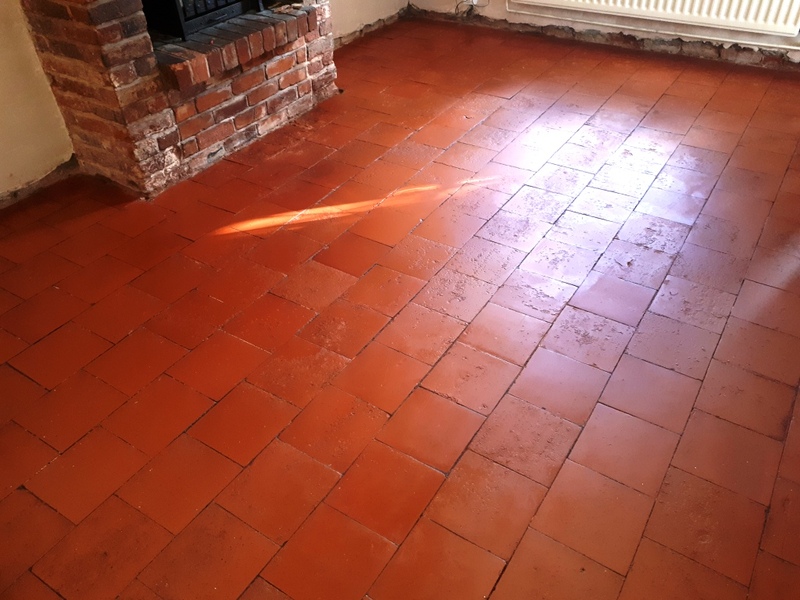 These old floors don’t have a damp proof membrane in place to prevent damp issues so to neutralise the salts I applied Tile Doctor Acid Gel to the floor. This was left in place for a short time before rinsing the floor again. The floor was then allowed to dry out for a couple of days. Upon my return I checked the floor for damp with a meter which gave satisfactory readings. 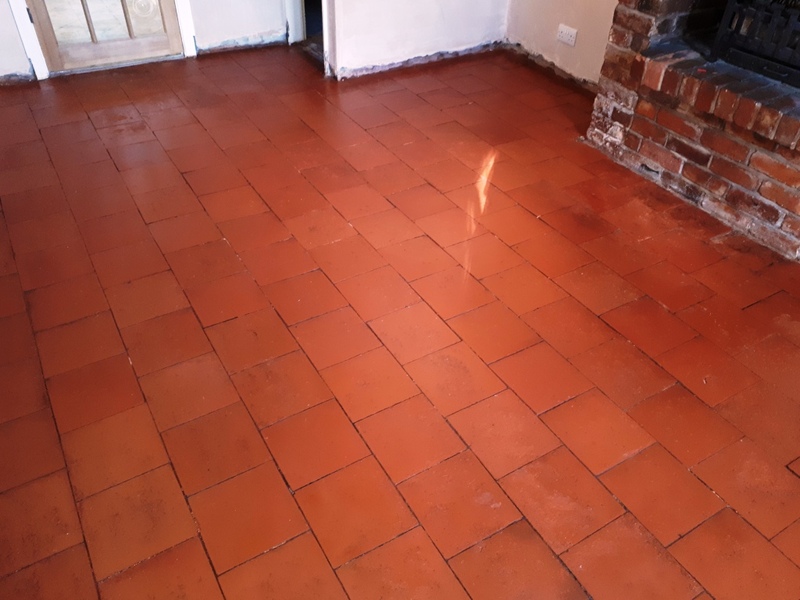 The floor was then sealed with two coats of Tile Doctor Colour Grow which is an impregnating colour enhancing sealer that really brought out the red colour of the quarry tiles.